The northern Illinois town of Freeport hosted the second and most famous of the seven Lincoln-Douglas debates on August 27, 1858. At the Freeport meeting on that day, Stephen Douglas outlined his famous "Freeport Doctrine." It was here that Abraham Lincoln asked Douglas, "Can the people of a United States territory, in any lawful way, against the wishes of any citizen of the United States, exclude slavery from its limits prior to the formation of a state constitution?" Douglas' answer was, "In my opinion, the people of a territory can by lawful means, exclude slavery from their limits prior to the formation of the state constitution." His answer angered the people of the South and split the Democratic Party. His words saved his Senate seat in Illinois in 1858 but lost him the presidency in 1860. Lincoln was elected our 16th president in 1860. Lincoln The Debater was designed and created by Leonard Crunelle, born in Lens, France, on July 8, 1872. After coming to the United States as a young man, Crunelle worked in the coal mines near Decatur, Illinois. Hearing that Crunelle carved figures from coal, Lorado Taft asked to meet the young man and recognized his talent. Later Taft asked the young artist to come to Chicago to help the sculptors who were working on the decorations for the Chicago World's Fair of 1893. When the fair was over, Crunelle returned to Decatur and stayed for several years. He eventually studied at the Art Institute of Chicago under Taft and soon was recognized as a major artist. Erected on a base of roughly hewn red granite, the statue stands among the trees in Freeport's Taylor Park. It depicts Lincoln as a very confident young man with the serious expression of a successful lawyer. It represents him at a time in his life when he was concerned about the great issues of the day and was a keen politician and debater. The spirit of the most important of the seven debates is definitely depicted by Crunelle's portrayal of the man. The hands behind his back hold a small roll of papers. The statue was dedicated on August 27, 1929, the seventy-first anniversary of the debate in Freeport. It was a gift of William T. Rawleigh, a prominent manufacturer in Freeport. Several of the speakers talked about the meaning and importance of the Freeport Doctrine. The exercises of the dedication day were conducted under the auspices of the Lincoln-Douglas Society of Freeport and Stephenson County. Leonard Crunelle stated, "In designing the statue of Lincoln the Debater, the aim has been to recapture the Lincoln of the period of his joint debates with Douglas, before he became President and belonged to the nation, and while he was still one with the plain people of Illinois." The principle speaker of the afternoon was Senator George Norris of Nebraska, whose glowing tribute declared the name of Abraham Lincoln to be "everywhere in civilization, emblematic of human freedom. The spirit of Lincoln still lives and is sufficient to lead the people to change our fundamental law so as to abolish any form of involuntary servitude regardless of the conditions on which it is based." At least 100 persons in attendance at the dedication had been present during the Freeport debate or some other debate in the Lincoln-Douglas series. Bullard, F. Lauriston. Lincoln In Marble And Bronze. New Brunswick, New Jersey: Rutgers University Press, 1952. Durman, Donald Charles. He Belongs To The Ages: The Statues Of Abraham Lincoln. Ann Arbor, Michigan: Edwards Brothers, 1951. Rawleigh, William Thomas. Freeport's Lincoln: Exercises Attendant Upon the Unveiling Of A Statue Of Abraham Lincoln; Freeport, Illinois, August 27, 1929. Freeport, Illinois: W T. Rawleigh, 1930. Stephenson County Historical Society. The Lincoln-Douglas Debate. 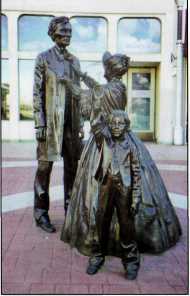 The life-size sculptures of Abraham Lincoln, his wife, and two of their sons stand next to Lincoln's law office across from the Old State Capitol in Springfield. The sculptures are the highlight of a program titled "Here I Have Lived," a series of more than 30 outdoor exhibits designed to explain Lincoln's life during his nearly 25 years in Springfield. "Here I Have Lived" is a demonstration project for the Looking For Lincoln Heritage Program. Springfield's Lincoln was funded primarily through a state Department of Commerce and Economic Opportunity tourism grant. The sculptor, Larry Anderson, was born in Tacoma, Washington, and attended that city's Lincoln High School. 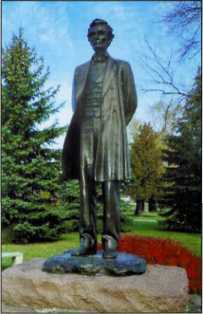 He lived in a city where a statue of Abraham Lincoln by Alonzo Victor Lewis is one of the most notable landmarks. His daughter was born on Lincoln's Birthday. "Lincoln has been a part of my life for a long time," Anderson said in a recent interview. The artist intended to create a single moment in Lincoln's life that symbolizes the effects that Springfield had on the future president. "He couldn't have gone from a log cabin to the White House without the polishing effects of a career in Springfield," Anderson said. "There he met Mary, became a father, a successful lawyer, then politically active." The scene of the sculpture is set on October 4, 1854, as Lincoln is walking toward the Old State Capitol to give a speech. It was during this time that Lincoln was reviving his political career and beginning to speak out against the spread of slavery. The sculptures are grouped in two couplets. Sons Robert and Willie stand across the street from each other waving as Robert leaves for school. This symbolizes Robert's frequent estrangement from his family. Mary is adjusting her husband's lapels, symbolizing her influence on his political and social life. Anderson has completed sixty-five bronze sculptures nationwide and is known for his passion for detail. He holds a Master of Fine Arts degree from the Cranbrook Academy of Art. He spent a year researching his subjects and 14 months creating the clay models for Springfield's Lincoln. It was his intention to create something very detailed and historically accurate. For example, the speech that Lincoln planned to deliver that day can be seen tucked into his hatband. The handwriting on the speech is as close to Lincoln's as possible. His right ear sits lower than the left, and his left eye wanders upward and outward slightly. Mary wears stitched gloves and a bonnet ringed with roses. The boys are wearing hats that were popular at the time. Robert is carrying books that he studied in school. As he worked, Anderson relied on photographs of Lincoln taken from 1858-1860. The statue was unveiled on June 5, 2004, in downtown Springfield. Mayor Tim Davlin said, "We are truly on the threshold of a new era in Springfield. With the Abraham Lincoln Presidential Library and Museum to open soon, this sculpture will be the closest thing yet to bringing our 16th President back to life. Visitors and residents won't have to imagine what it was like when Lincoln walked downtown. They will now be able to capture the very feeling that townsfolk in the 19th century experienced when the traversed the same pathways." Carl Volkmann of Springfield is the former director of the Lincoln (public) Library. Now retired, he is writing a history of Lincoln-inspired sculpture in the state, from these articles are derived. Antonacci, Sarah. "Lincoln Family To Take Its Place at Old Capitol." The State Journal-Register, May 31, 2004. Landis, Debra. "In His Footsteps: Sculpture Unveiled At Old Capitol." The State Journal-Register, June 6, 2004. Pokorski, Doug. "Sculptor Designs Lincoln Statue." The State Journal-Register, August 17, 2003. Stratton, Nicky. New Family Sculpture Unveiled In Springfield. Looking For Lincoln Heritage Coalition, 2004. Tucker, Rob. "The Lincoln Family, To The Smallest Detail; Local Artist Captures Abe." The Tacoma News Tribune, February 16, 2004.